Plan Ahead and Prepare! Check the BATS website for Trail Conditions Updates on the Home Page. We will update our Facebook as well. 1) 1) Avoid trails if too muddy or if they are starting to thaw out. Best to use when ground is frozen. 2) If icy, please wear traction on your shoes or have studded tires on your bike. 3) Please avoid making trails wider or short-cutting trails. 4) Go out before trails get muddy, earlier in day or later in the day. Early winter with all it’s temperature fluctuations can be just as bad as mud season (~April-May) in which all trail organizations in Vermont encourage users to recreate on dirt or paved roads instead. 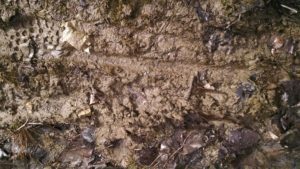 Freeze and Thaw cycles can be wreak havoc on trails. If the temperature outside is warm-ish AND it rained or is thawing, you should AVOID using trails until they dry out. Find a more durable trail, dirt road, pavement, your driveaway, or (gasp) the gym. -If it snowed and the snow is melting, the trails are probably muddy and icy and need to dry out. Seek an alternative activity, or use a drier trail / trail network/find a great dirt road. It takes MANY more hours to fix the trails that have been impacted by people using them incorrectly during these sensitive times. Why Are We Telling You This? Using trails that are muddy creates ruts, widens the trails,and damages vegetation. 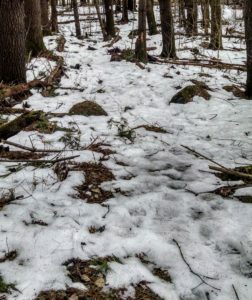 Using trails that are icy creates impacts, especially if you aren’t prepared as this causes people to widen the trails as they realize “oh wow, this is slippery”, which compacts the snow/ice, which affects plants and soil once everything thaws, and can create erosion problems. We’d like to keep the trails in good shape. Please do your part and be a responsible trail user. In Winter, many people enjoy snowshoeing and fat-biking on the BATS system. Snowshoers, if you don’t know the terrain, stick to established trails in winter. There is definitely room for exploration, but be mindful that Mt. Anthony has many rock faces and steeper areas, and adjacent areas that become private property where we do not have easements. Go off-trail at your own risk, and be prepared before you go. All winter trail users please look at the map in advance and have a copy with you, bring a headlamp and extra clothing layers. It gets dark early, and snowshoeing and winter riding is hard, so you may be out longer than you expect.